1 "Good morning, boys and girls. I'm Rachel Scott, the host of Bugs Beyond Belief. Today I'm pleased to introduce you to one of the strangest but coolest bugs around. She's also the skinniest bug we've had on the show. You might even say she's skinny as a stick. Her name is Sylvia, and she's a stick bug." 2 "Good morning, Rachel. And thank you for that nice welcome. You're right, I'm very thin. We stick bugs are made that way." 3 "Really? Tell us a little bit about what you look like." 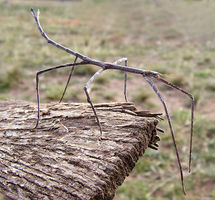 4 "There are thousands of kinds of stick bugs, or phasmids as we're also known, all over the world. Most of us live in the tropics, though. We all have one thing in common - we look like sticks. We've got really long and really thin bodies. Our legs are also long and thin." 5 "You know, if I saw you hanging from a tree, I'd think you were part of the tree." 6 "Yes, and we count on that to keep us safe from other animals or bugs who'd try to eat us." 7 "Sylvia, you've been sitting in your chair rocking back and forth since you got here. Is something wrong?" 8 "Oh no, Rachel, I'm fine. I like to rock back and forth. Some people think it's so I can see the things around me better. Some people think it's another way I can look like a stick in the breeze. Me, I just like to rock."